Recently, AT&T sent out a notice that, as of June 1, it is giving current and former management employees the additional option to receive a full lump-sum payout. This is great news! Previously, management employees could only receive either a partial lump sum and residual monthly annuity, or a full monthly annuity. A full lump-sum payout option allows you to receive your entire benefit as a one-time payment once you retire. You may then roll it over into an IRA and invest it however you want. You’re eligible for this new payout option if: (1) you left AT&T and your last day was on or after May 31, 2018; (2) the day you choose to receive your payment (commencement date) is on or after June 1, 2018; and (3) you have not already started receiving pension payments. AT&T says Fidelity, which is the AT&T pension plan recordkeeper, will be prepared to start administering full lump-sum payouts on October 1. Until then, you’ll be able to get an estimate of your full lump-sum payout beginning on June 15 by logging into your account at www.netbenefits.com/att. 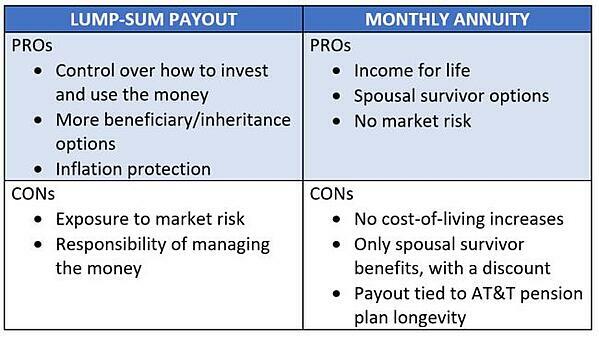 There are several pros and cons to each pension payout option. For example, a lump sum gives you greater control and flexibility with your money. But, a monthly annuity can offer the comfort of a guaranteed paycheck each month. Another thing to take into consideration is the interest rate used to calculate AT&T pension payouts – the Composite Corporate Bond Rate. The rate set in November of the year before your commencement date will determine the amount of your lump sum. Generally, when rates are lowered, lump-sum payouts are increased, and vice versa. Therefore, rate changes may affect your decision whether to retire early or continue working, as well as to take an annuity or a lump-sum payout at retirement. Ultimately, whether a lump-sum or traditional monthly payout is best for you depends on your personal financial needs and goals. Your pension is an important income source for retirement. However, it’s only one part of your overall financial picture. 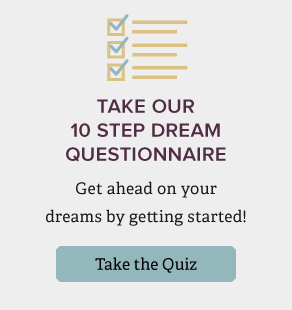 There are many more factors to consider before you decide which option is right for you. Among those include your AT&T 401(k) savings, Social Security, other income sources and marital status. Advance Capital has helped thousands of AT&T employees with all aspects of their financial lives, from managing their AT&T 401(k) plans to maximizing their AT&T pension options. Our 30-year history of working with people like you gives us a unique perspective of AT&T retirement benefits. If you have any questions about your pension or would like us to help you build a sound retirement plan, please contact us to arrange a meeting or telephone conversation. You can also learn more by downloading our go-to guide on AT&T retirement topics: The AT&T Employee’s Guide to Retirement. Click the button below.